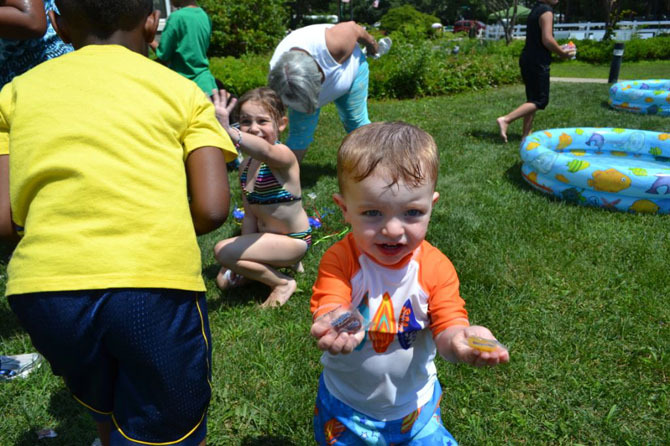 Two-year-old Gavin Schrage shows off the two pieces of candy that he received from the piñata at Islandia Village’s 9th annual BBQ. On July 12, more than 500 Islandia Village residents came out to the 9th Annual BBQ. Village employees and local Boy Scouts served residents hamburgers, hot dogs, ice cream, soda and water. Children enjoyed the day with hayrides, games, pony rides, a petting zoo, arts and crafts, face painting, piñatas and a dunk tank. A local DJ provided the music to keep the party going. Local elected officials were also in attendance. In addition, Mayor Allan M. Dorman hosted a blueberry pie eating contest with the winners each getting a blueberry pie.